When the Atari 400 and 800 computers were released in 1979 they were a closed system. That is, only Atari personnel knew the details of the hardware that were necessary for the development of software. This gave Atari a monopoly on the system thus eliminating third-party software. This was one in a long series of errors that Atari made in their business plan. A few years later they realized their mistake and set about to correct it. One of the first things they did was write a series of articles detailing the key aspects of Atari hardware that were needed by programmers. This was published in book form as De Re Atari in 1982. Some of the articles appeared in magazines such as Compute! and BYTE prior to 1982. Here is one on player-missile graphics by Chris Crawford that was published in Compute! in 1981. Interestingly, De Re Atari was sold through the Atari Program Exchange (APE) as an unbound set of pages with holes to put them in a three-ring binder. 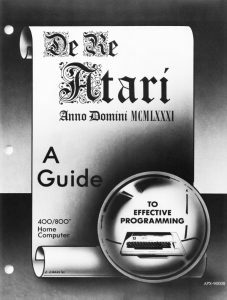 De Re Atari covers a lot of key topics for Atari programming in BASIC and assembly language including details of the ANTIC chip that are needed for display lists and display list interrupts, for example. This is a must-read for anyone serious about learning to program on the Atari 8-bit computers. Consider it an essential reference. You can purchase new old stock of De Re Atari in print from Best Electronics for $29.95. Search for it on the page. This is what I did. I have mine in an original three-ring binder from Atari. I also have my original copy in a binder from back in the day. It is also freely available in web form from AtariArchives.org and as a PDF from archive.org. The book had a huge impact on Atari programming back in the early 1980s. In fact, you can see authors of other books and magazines closely paraphrasing what was said in De Re Atari indicating what an important reference it was. I can always tell when an author is doing this. One can only wonder how making the Atari 8-bits open from the beginning would have boosted their competitive edge. Having tons of third-party software and games would have helped establish their computer line as the one to own. It certainly would have helped their battle with Commodore. Those few lost early years from 1979 to 1981 were crucial. As Atari guru Bill Wilkinson said “I must heartily recommend that every serious Atari programmer trade in his or her left thumb, if necessary, for a copy of this book”.